Professor Richard Smallwood is well known to the University of Melbourne for his achievements in medicine as a clinician, researcher, educator, medical administrator, for his contributions through some of Australia's leading medical bodies and as a consultant to government. Following initial training in the emerging field of hepatology, Professor Smallwood established and developed the discipline at the Austin Hospital in Melbourne and provided mentorship and academic leadership in the field for a prolonged period. This influence reached well outside the Hospital and included his role as the initial sponsor of a Victorian collaborative group for the study of viral hepatitis. He dedicated more than 30 years to undergraduate and postgraduate teaching. As a clinician researcher at Austin Hospital, where he was Head of the Department of Medicine, Chairman of the Division of Medicine and Director of Gastroenterology of the Centre, he published over 250 clinical and scientific papers and co-authored Clinical Skills: the medical interview, physical examination and assessment of the patient's problems with Professor Richard Larkins. His interest in the advocacy of medicine led him to channel his time and expertise to such distinguished bodies as the National Health & Medical Research Council and The Royal Australasian College of Physicians. His active involvement and participation culminated in his leadership of these two bodies – held concurrently in 1997, a very noteworthy achievement indeed. His ability to encourage organisations to scrutinise their mission and external relationships was a hallmark of his tenure in these leadership roles. This quality was allied with a clear and contemporary vision for what was possible in medical practice and research and a highly inclusive leadership style. 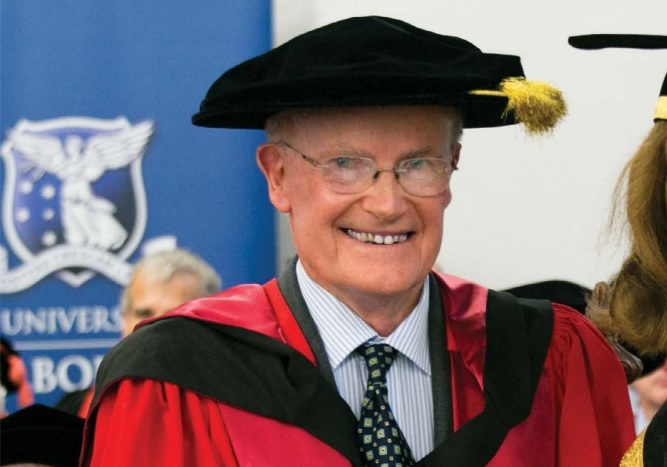 Professor Smallwood’s contribution and service to medicine was recognised in 1997 when he was named an Officer of the Order of Australia. He has an outstanding international profile and is acknowledged widely in a very broad range of fields including hepatology, public health, medical education and most recently, professional regulation. As Commonwealth Chief Medical Officer, Professor Smallwood saw the need for balance between maintaining national security and informing the public as a priority at a time of heightened awareness of possible terrorist-inspired emergencies and epidemics. Drawing on his experience in medical administration and his involvement in a wide range of professional bodies, he engaged others to focus their minds and knowledge on tackling issues such as the protection of Australia from communicable diseases or pandemics and to work with him to produce a comprehensive report. In serving on numerous national committees, and as a panel member on a number of key inquiries into medical events of importance to the community, Professor Smallwood has demonstrated a remarkable ability to untangle the complex chains of events involved in major medical mishaps and to identify relevant learning points for further consideration. The introduction of the National Registration and Accreditation scheme for the regulated health professions coincided with Professor Smallwood's tenure as President of the Australian Medical Council (following his role as the Chair of the Council's Strategic Policy Advisory Committee). With the Council thrust into a prominent position by the changes, he became the key representative of the regulated health professions in negotiations with the Commonwealth Government. As Chair of the Forum of Health Professions Councils he has extended his sphere of influence far beyond medicine to the introduction of new standards of quality and safety in professional practice for a diverse range of health professions. In addition to his exemplary professional career, Professor Smallwood has a remarkable way of engaging with and engendering enthusiasm in others, whether they are patients, trainees, peers, senior leaders and decision-makers of our nation, or anyone he might meet during the course of his day. He demonstrates all the fine qualities we look for in a leader, a physician, a mentor and a friend.